With Lent just one week away, my mind has turned to how I want to spend this Lenten season. I shared some ideas for almsgiving as a family that we hope to try this year. I've been thinking about what I want to sacrifice - Target is at the top of the list this year again. No more splurges in the Dollar Spot - even for educational or blog purposes. That should make my husband (and our budget) happy! And now I need a plan for prayer. I've been loving the addition of my Catholic journaling Bible to my prayer routine and the fact that I can be creative while I'm praying and reflecting. But I knew I needed something more. 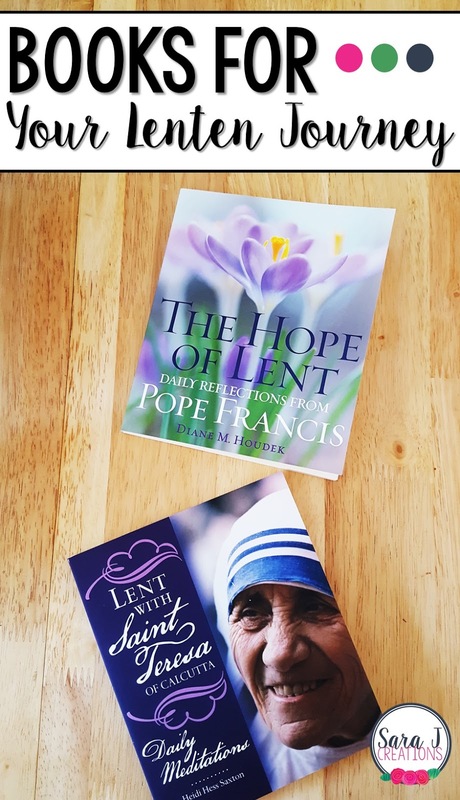 When I heard about the new daily reflection books (Lent with Saint Teresa of Calcutta and The Hope of Lent Daily Reflections from Pope Francis) that just came out, I was eager to give them a try this year for Lent. I plan to dig deeper into them during this Lenten season, but I scanned through them so that I could share with you so you can get your hands on a copy before Lent begins. This book opens with the story of the Missionaries of Charity Sisters who were killed in Yemen in 2016. It is gut wrenching to read but it is used to connect us to Lent and to think about who we would be in the story and how we would act in a moment of crisis. For each day there are scripture passages for the day, a reflection by the author that incorporates the life and teachings of St. Teresa, reflection questions, and a prayer. Each day this is about 2-3 pages, so a quick read. I like this book a lot because it can be used year after year. There are no specific dates just days of the week such as "Friday of the Second Week of Lent." You are also given bits of St. Teresa of Calcutta's life and teachings throughout the book. These are tied in with the scripture passages for the day. I've always gravitated to quotes by St. Teresa because they are so relateable and relevant to our lives even though she lived and worked in a context that most of us can not relate to. Pope Francis is another one who has fantastic quotes that are so relevant. I am excited to dig deeper into this text to become familiar with more of his writing and teachings. This book can also be used each day during Lent year after year since there are no specific dates, only days of the week. Each day includes readings from the day, a Word from Pope Francis, Taking the Word to Heart, Bringing the Word to Life and Pope Francis Prays. Each day is 2-3 pages in length. There are questions to ponder and reflect on throughout the text. This book aims at finding the extraordinary in the ordinary by finding God's mercy where we least expect it. Both of these books would make a great daily meditation during Lent. They don't require a lot of time but give you a lot to think about as we prepare for Easter. Have you found any other good books for Lent? Next up on my list is to find some good picture books for my girls to read during Lent and Easter so they know the focus isn't the Easter bunny and spring! Let me know if you have any good suggestions.